Here is my most recent swap creation. Love the way it turned out, even if it was a little stressful getting 20 in the mail last week!! I never give myself enough time!! I also did this with my club girls yesterday and it was very well received, even though we had parts going every which way for a while!! Didn't help that I forgot the markers too, but we made it work!! Here is the front, which looks like a regular card from this vantage point. 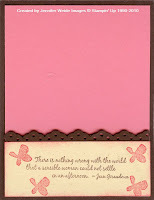 Card base is Chocolate Chip, background accent is Regal Rose, and background Naturals Vanilla. I stamped the tall stem image from Watercolor Trio across the lower center of the card, some full strength, some off once. 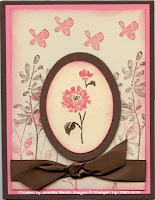 Then I came back over with the curved stem/flower image in Regal Rose. Butterflies across the top in Regal Rose, and a Chocolate Chip satin ribbon knotted at the bottom. 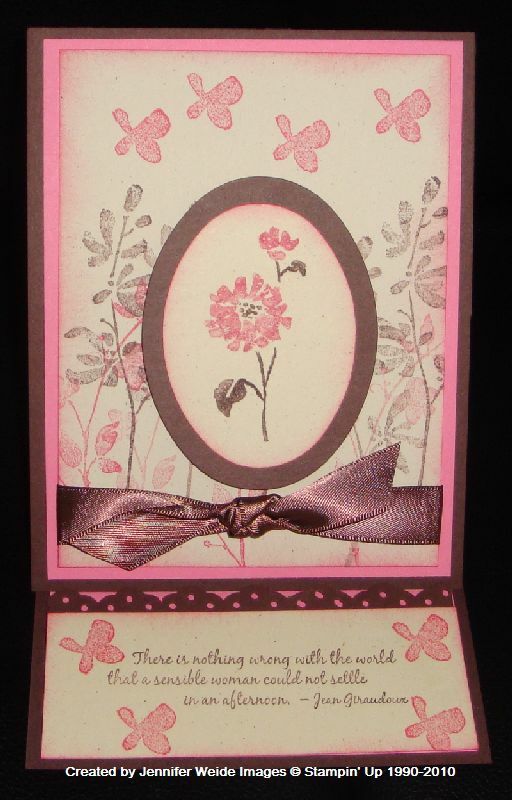 The focal point is cut using the Ovals die for the Big Shot. A recent acquisition for me, and I'm wonder why I didn't notice & get it earlier?? Perfect size for this flower image from Watercolor Trio. The flower was colored with Regal Rose & Chocolate Chip markers. The Naturals Ivory edges are all sponged with Regal Rose. Here is the inside of the card. I don't normally do much with the inside, but for an easel card it needs something to lean against! So, we set another piece of Regal Rose cardstock inside, and added a strip of Chocolate Chip that we had used the Eyelet border punch across the top, and another piece of Naturals Vanilla. 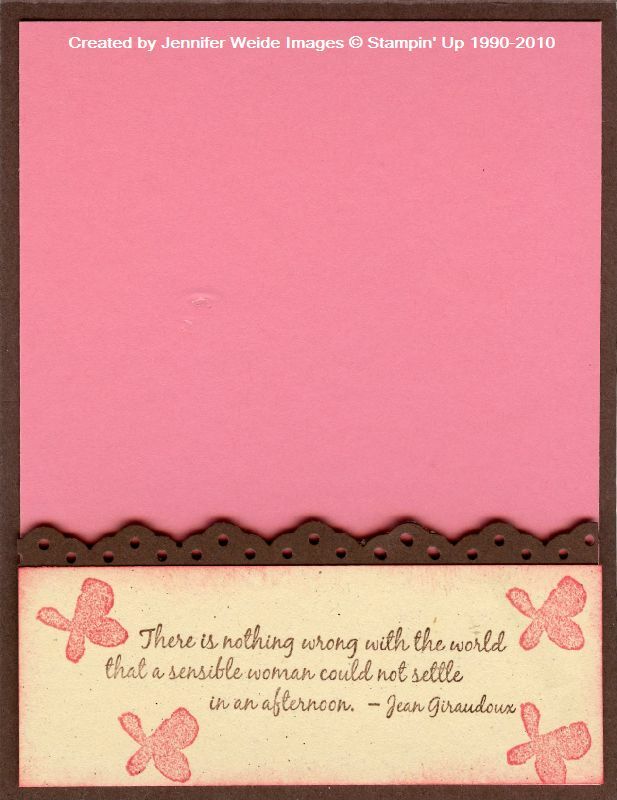 On this we stamped one of the sayings from Favorite Thoughts, and a few more butterflies. When we attached this, we put half dimensionals across the top, regular snail on the bottom. This gives it just enough lift to catch the card front, see below! This is a view from the front when standing up. I got the directions I used here on Splitcoaststampers, and I went with "optional" measurements for a traditional sized card. The card base here starts out 11 x 4-1/4, and you score at 5-1/2 & 8-1/4. The 5-1/2" fold gives you the back of the card, fold the 8-1/4 up. To this we will attach another piece of Chocolate Chip, card front size (5-1/2 x 4-1/4) with Sticky Strip. From there you add your layers and embellishments and you're done!